Tohono Chul Park is a small botanical garden, nature preserve, cultural museum with a great dining spot all rolled into one. The name “tohono chul” comes from the Tohono O’odham language. The Tohono O’odham people are indigenous to southern Arizona. 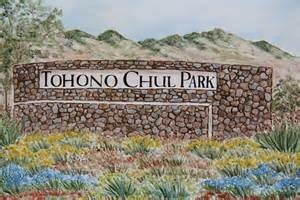 The translation for tohono chul is “desert corner” and fittingly describes the 49 acres of Sonoran Desert that is Tohono Chul Park. In 2010, Travel + Leisure Magizine named Tohono Chul one of the worlds top 10 botanical gardens. There are well marked trails that meander throughout Tohono Chul Park. Leisurely strolls provide visitors an opportunity to see the striking contrasts of the desert and its beautiful plant life. The park provides an extensive array of plant live, flowers and cacti found in the great Sonoran Desert. Each building located in the Tohono Chul Park has a history all its own. The homes were built during the period from 1937 through the mid 1960’s. Each home reflects the southwest style of the period in which it was built. What once were homes are now the facilities that house the museum shops – La Galeria and La Fuente – and the popular Tohono Chul Garden Bistro. The last building, a hacienda style home, is used for the La Entrada Greenhouse and Garden shop. At the Bistro, one can experience the flavors of the southwest while taking in the spectacular views of the Santa Catalina Mountain range in the background. There are numerous events taking place at Tohono Chul throughout the year along with special galas and activities within the unique setting the park offers. In 2014, Tohono Chul became an official Monarch Way Station. As such, the plant life and shelter necessary to sustain monarch butterflies is provided as they migrate through North America. Tohono Chul Park is a place for residents and visitors to get in touch with the Sonoran Desert that surround Tucson AZ. A visit to Tohono Chul Park is inexpensive and provides a opportunity to see the beauty of the desert plants, cacti and butterflies of the desert we live in. If you are moving to Southern Arizona for a new job, lifestyle change or future place to call home, we can help!